If there was any doubt that the buyers of commercial vehicles, particularly M&HCVs, would delay purchases due to the new axle load norms which allows an increase of 25 percent GVW, then that would be dispelled by the sales numbers CV OEMs have reported for the month of July 2018. The Indian Foundation of Transport Research and Training (IFTRT), which tracks monthly freight rates on key routes in India, says that in spite of the increase in axle load limit payload by 20-30 percent from July 16, there has not been any real impact on the sale of CVs, which have grown in strong double-digits. IFTRT reported a drop of 6-7 percent in truck rentals for July. This is meagre considering there was an increase in diesel price by Rs 0.51/litre during the month, a partial road transport strike, 20-25 percent drop in arrival of vegetables and food items due to heavy rains. CV market leader Tata Motors sold 34,817 units in July 2018, higher by 25 percent over last July. The critical M&HCV segment registered a strong performance with sale of 10,233 units (+18%). Its ILCVs sold 3,985 units, which marks 17 percent YoY growth due to growing demand from the e-commerce sector and increased rural consumption. The recently launched range of Tata Ultra I&LCV trucks is gaining consumer acceptance and now contributing to the volume growth. Meanwhile, Tata’s cargo SCVs and pickups together sold 15,639 units (+ 38%), the hub-and-spoke model driving demand both in urban and rural India. It is understood the recently launched Tata Ace Gold has been well received in the market. The commercial passenger carrier (bus) segment saw sales of 4,960 units (+12%), led by significant demand for school buses, vans and ambulances. STU buying is also showing an uptick. According to Tata Motors, its M&HCVs were impacted due to the new regulation on axle load limits due to the uncertainty around the new limits applicable to the existing fleet of trucks. However, this was offset by demand for M&HCV trucks from infrastructure development, road construction, building of irrigation facilities and affordable housing projects across the country. The new BS IV range of Signa and Prima trucks and tippers are claimed to be faring well in the market. Ashok Leyland’s sales too saw an uptick with 15,199 units, a YoY growth of 27 percent (July 2017: 11,981). While the company sold 10,996 M&HCVs (+22%), LCVs recorded strong 42 percent YoY growth at 4,203 units sold. (July 2017: 2,955). Mahindra & Mahindra, which has just launched its new Furio ICV range, saw its overall CV sale up by 28 percent to 19,284 units (July 17: 16,261). M&HCV numbers were up by 32 percent to 866 units (July 2017: 657). The below-3.5T GVW segment grew by 29 percent YoY, selling 17,785 units (July 2017: 13,761), while those in the above-3.5T GVW segment registered growth of 5 percent with sales of 633 units (July 2017: 605). VE Commercial Vehicles is also posting strong growth – 5,158 units which marks 38.7 percent growth (July 2017: 3,718 units). The commercial vehicles sales remain upbeat as the sector continues to clock strong double-digit growth month on month. After strong sales in Q1 of FY18-19 on the back of low base effect, CV sales continue to perform well. In Q1, FY2019, overall CV sales were 230,095 units, clocking 51.55 percent YoY growth. Which means industry is well placed at this stage of the fiscal year. 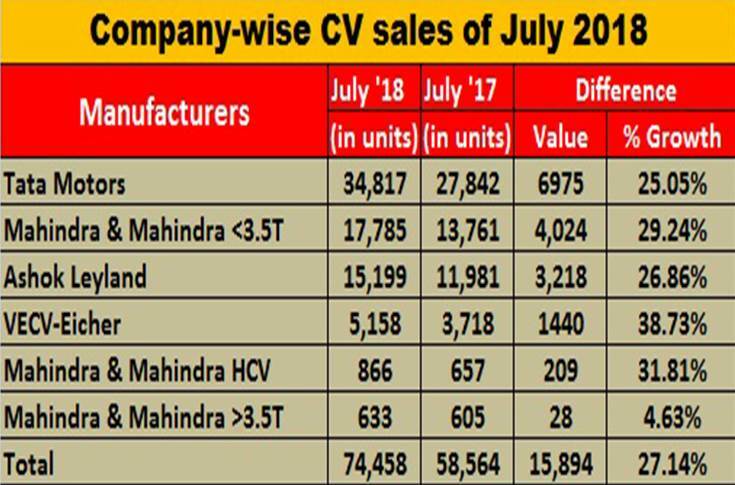 Although, the higher rate of growth has moderated, OEMs have maintained strong double-digit growth in July with both M&HCV and LCV sales rising briskly. With continuing government spend on infrastructure projects, rising shipments from the e-commerce industry and return of demand from rural India are driving growth for the sector. And it is expected to stay that way in the near term.